Mad caps and a half dozen Indian men. That’s not the title for the next sitcom, but something that describes our situation, sitting two abreast across three rows of Maruti’s latest offering. The perennial small car manufacturer has gone big, but has used its small car knowledge to the hilt in putting it together. That explains why Toshihiro Suzuki, the man who led the engineering of the Ritz and now the Ertiga, was on stage at the Auto Expo to unveil the Ertiga to the world. He, of course hasn’t met all the wild cats in the BSM team and must be glad for it. We descended on his creation like a boisterous average Indian family, with all the necessary props for tomfoolery, but the intention was very serious – is the Ertiga all the car an Indian family will ever need? Wants car-like driving mannerisms, fuel economy and a degree of premium-ness to make his parents proud. Also wants refinement and low NVH levels – the noise the family makes is bad enough already. Wants to – you guessed it – sleep in comfort. When not sleeping, he wants to be able to read, so the suspension characteristics are important for him, and yes, he is a backseat driver par excellence. Wants excellent ride-quality given the acute backache she suffers from. She also needs to be able to get in and out of the car with ease, strong value-for-money (it's her son's hard-earned money after all!) and the lesser the body roll, the better the knitting! Wants daddy dearest to race other cars and beat them – performance and thrills are a priority. Since he'll spend most of his growing up years in the last row, comfort is a must-have. Wants to break everything in sight (that includes his brother), which means that solid interior quality is very important. He also wants to play only his music all the time (Taylor Swift, Justin Bieber...) and, hence, wants the car to have an aux-in port and USB compatibility. That would be Akshay then, starry eyed and the youngest of the lot. Never mind, he doesn’t know that poor me can’t even put together a month’s worth of EMI at the end of the year for a Q7, so all I can do is pacify him with Excel sheets of my boss’ Q7 maintenance bills. He shuts up soon enough and we proceed, heading to Khandala on the outskirts of Mumbai, picnic basket in tow and a glint in our eyes. Soon enough, to cut our journey, we make the first of several stops at the McDonalds outlet at the start of the Mumbai-Pune expressway. While Mommy drags the incorrigibles by their ears for breakfast, grandmother and grandfather take their own sweet time to pull themselves out. Since the cleaning boy decided to take his weekly, untimely off that morning, I was left with the task of bringing the Ertiga back to showroom condition. That’s when it gave me the opportunity to admire the work of Suzuki’s design team. Yes, you may find the likeness to the Ritz too strong, but it’s a fairly balanced design in as few words as I can put it. The tail light treatment does look like an afterthought, even if it’s probably got more to do with the practicality of using the tail gate. 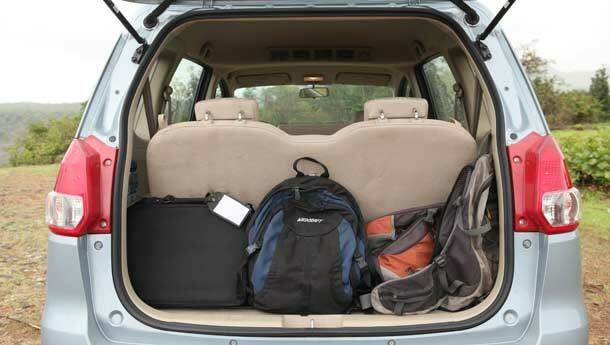 What is interesting to note is that at 4,265 mm, it’s just as long as the Etios sedan, but packs in space for so many! McDonalds meal done, family back in, it’s time to go. There’s a racket in the third row, the kids are at it again, this time over the Happy Meal toys. Ruman somehow snatched Lightning McQueen from Akshay and shoved Mater into his hands. A fist fight just about started before grandfather snorted, stomped his walking stick twice and thundered, ‘Sort it out kids’. Phew, he saved me from total annihilation. That would be the last conversation between my mama and the wife before I drove out of the parking lot and got on to six lanes of bliss. So far, it’d been fairly uneventful by Indian family standards. No one asked me to adjust my seat (and therefore drive the car ape-like) and the overgrown kids in the last row weren’t all over their grandparents in the second row either. Have Maruti Suzuki engineers struck gold then? Is it the most masterfully done piece of packaging in recent Indian automotive history? To answer those questions, first let’s look at the layout itself. Three rows that can technically squeeze seven, with three in the second row, though for all practical purposes it’s best as a six-seater. The arm rest and the high cushioning in the centre may be good for a child seat, or someone terribly anorexic. Six large adults can fit in. What the last row could have had was slightly better access. Maybe Maruti could have offered captain chairs for the second row and therefore made getting in and out a wee bit easier. But it isn’t much of an issue, because it’s pretty much the only large compromise in the package. Since the entire second row can move fore or aft, it allows for some space creation for the third row, which is always good. After all, Indian families are masters at compromise, as our TV serials would like us to believe. Do that and there’s still good leg room for everyone, hatchback good if not sedan good. Both rows can be flipped over and it becomes the ideal vehicle to shift home in too. The seats themselves are decently comfortable, but could do with a bit more bolstering and support. Grandfathers. Fathers for some. And with one too many wise suggestions. Agreed, but I am a family man, stuck with what should be a family car (which it is proving to be) with an engine that begs to be revved. Am I then to take it easy if what I have in front of me is wide, nearly empty expanses of a six-laned road? Hell no! The motor then. I said it loves to be revved. Yes, indeed. The third in a line of K Series motors (and probably the last), it’s a wonderful culmination of what Suzuki engines are known for. It is rev happy, sounds like a Suzuki twin motorcycle at high revs and then returns some pretty good numbers at the pump despite being driven hard. No need to explain why half of all new cars sold in the last decade in India have been Marutis. The 1.4-litre engine is good for 94 bhp@6000 rpm. It’s so good that Maruti should threaten to slap it on the Swift and call it the Swift Sport – their idea of a ‘warm’ hatch. Because it is based on the monocoque Swift platform, the front-engined, front-wheel drive MPV is a sort of unique application for a market filled with rear-wheel driven ones as competition. Its plump-by-petrol-standards 13.2 kgm of peak torque may come in at 4000 rpm, but its light-weight 1,160 kg is just what the doctor ordered. Yes, there’s a diesel too for those who like to see their bank accounts glow, but I’m not that sort of family man. Especially since that’s what that old man in the middle row thinks. It’s quick too. Stand on the throttle when the family is busy sleeping at home and it can put fellow dragging hatchbacks to shame. A run of 12.6 seconds to 100 kph is up the alley and a top speed of 170 kph is seriously good for a small-engined, family hauler. And driveability isn’t bad either. In the city, when father is left to commuting to work and back, he will find that the engine isn’t stressed. In case he has to please his subordinates or his family over the movie outing, he may find that it could be slightly better. On the highway though, the mid-range torque spread is quite good, though the diesel is probably even better in that regard. And it returns a good 13.2 kpl to the pump overall. With the family in tow. Impressive in these days of petrol in the low seventies, eh? Dutiful son and dutiful husband. Wow, Indian men clearly have it tough. 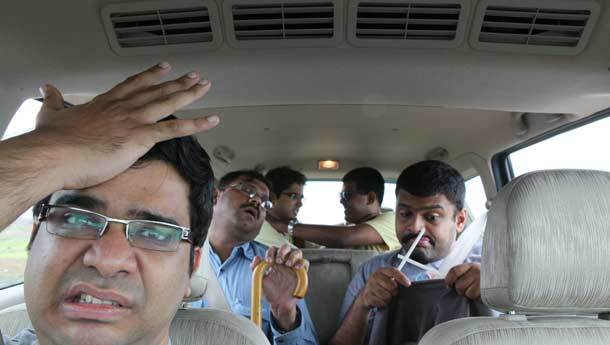 Of course, with six people, you can’t be corner carving around Lonavala’s ghat sections. Unless of course you leave them at the restaurant and head out under some pretext, only to turn up an hour later. 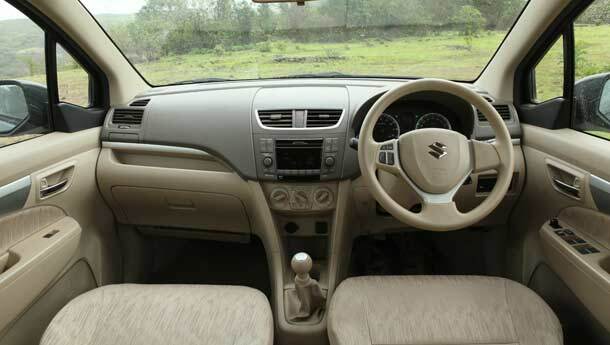 Then, the Ertiga does come alive. Up to 85 per cent of its grip limit, the MPV clearly exhibits its Swift genes. Quick to turn in, nicely weighted steering and some good front-end grip make it quite some fun, high centre of gravity be damned. It’s only if you go beyond that do you feel the need to rein your right foot in. On empty, wide, straight stretches, deep into three digit speeds with the road surface rather wet, it holds its line very well. Straight line stability is truly impressive at full load. Ride quality is good, the only drawback – as mentioned earlier – being that those in the last row might find it a bit bumpy. Though, if you consider the fact that it is a small monocoque MPV, its dynamics are pretty sorted. Turning up at home a few hours later, with everyone not completely drained of every ounce of energy, is the Ertiga’s biggest achievement. It may be smaller than its competition, but it’s a cleverly packaged, well put together vehicle that is rewriting the car-making rule-book. 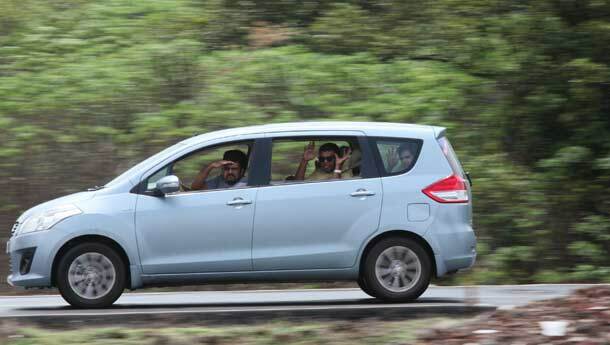 For those still confused, the Ertiga is the ideal family vehicle for 90 per cent of the time. It smartly mixes urban and extra-urban utility. The rest can still plump for the Innova or Xylo. As for me, the next time role play is the theme of the story, the character of a truant kid it is! He does like the car-like mannerisms, the performance and economy. But he needs a strip of aspirin for the drive home. Having taken all the photographs and failed to put duct tape round her kids, she did manage to find enough storage bins for all those knick-knacks. Generally well behaved till the end. Grandma liked that her knitting was more or less in place, because the Ertiga didn’t roll much, while she appreciated the decent ride quality too. Like her husband, the good fuel efficiency was to her liking. Unhappy that he wasn’t getting the Q7, and not too happy being in the last row, he did mutter,however, that space was okay. Father not getting involved in street racing wasn’t to his liking too. He tried hard, but sitting in the last row, he couldn’t find much to break, apart from his kid brother’s jaw. Mummy dearest played Kanye West for a bit, but then reverted to her jazz. Very annoyed!